Nar Phu and Tilicho Lake Trek is one of the most excellent off the beaten trail treks in Annapurna through the hidden valley of Nar Phu; the land of Snow Leopard, Himalayan Thar, Mask deer released for foreign visitors just in 2003. This trek offers the visitors with an incredible experience of unique culture in Nar Phu and mesmerizing view of majestic mountains in the high lands, Bhote communities, beautiful medieval and ancient remote villages, amazing rock formations, glaciers, several passes, narrow canyons, lovely forests, old Tibetan Buddhist monasteries, unique Himalayan and Tibetan culture, real local life styles settlements in high altitude. The Nar Phu Valley and Tilicho Lake trek is most fascinating destination for those who seek the venture into some of the less trodden isolated regions of Nepal apart from the regular trekking routes. Discover the hidden valley of Nar Phu along the "off the beaten path" crossing through challenging high passes of Kang La, Meso Kanto and visiting the World's highest Lake Tilicho. Naar Phu Valley is a wild and unexplored Tibetan villages located north of Annapurna which is controlled area and freshly opened for the trekkers only since early 20s. This rugged and wild trek to Nar Phu and thrilling Mesokanto La Pass via Tilicho Lake is perfect adventure for trekkers who want to explore the Annapurna area as well as explore an untouched valley. Nar Phu and Tilicho Lake trek takes you to the exotic valley that lies in the remote corner of the Annapurna region. The Naar Phu valley remains untouched by modernity. Trekking in the area is unlike most of Nepal as the terrain is Trans Himalayan and similar to that of Tibet. This recently opened Nar Phu Valley trek also can be combined Tilicho Lake and decades long famous Annapurna Circuit Trekking. The topography of Nar and Phu Valley is similar to that of Tibet. The trails are still rugged and the people and culture has remained intact. 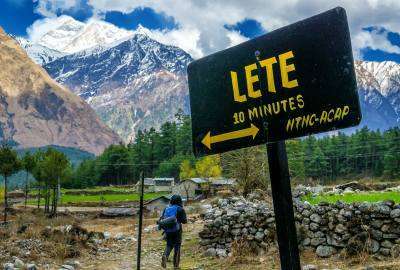 Restricted Area Trekking Permit is mandatory to visit this place and group size must be minimum two parties and trip must be organized with registered trekking agency in Nepal as per state law of Nepal. After a couple days of exploration of the valley, we cross over Kang La Pass 5322m on the way to Manang. We leave the main Annapurna Circuit Trekking trail and precede to Jomsom following the best-kept secret remote trekking route of Mesokanto La Pass 5240m and Tilicho Lake 5300m the world’s highest situated lake. Obviously, this remote and rugged trail offers challenging and exhilarating trekking experience for adventure enthusiasts. Day 12: Ngawal to Manang (3,540m.) 3-4 hours walk. Day 17: Jomsom to Pokhara by flight and rest and relax Pokhara. Day 01 :Meet and greet in Kathmandu We have included your travel time in the itinerary. On first day you will depart from your homeland flying to Nepal will be amazing experience with Nepal's long Himalayan Panorama from the plane if you have right side window seat. Wilderness Excursion agent will welcome you in airport and transfer to your selected hotel in Kathmandu. A short briefing about your Annapurna Circuit Trek and welcome drink will be held. Overnight stay in Kathmandu. Meals: Not included. Day 02 :In Kathmandu, Today; it is rest day, or preparation. We get permits and arrange rest of things for our trek to Annapurna Circuit, you have choice for a guided tour to some of the most chronological and spiritual attractions in Kathmandu which are also listed as UNESCO World Heritage sites. We visit the historic Durbar Square, the sacred Hindu temple of Pashupatinath, the famous 'Monkey Temple' (Swayambhunath) and Buddhist shrine (Boudhanath), which is also one of the largest stupas in the world. At noon, we get our equipment checked by our climbing leader, get introduced to fellow participants. If you would like to; we can remove day 02 in Kathmandu but we recommend you to spend your second day considering acclimatization, Kathmandu is 1350m from sea level. Overnight in Kathmandu. Overnight stay in Kathmandu. Meals included: Breakfast. Day 03 :Drive to Jagat (1300m) After breakfast; We set up off our journey into the hills on a winding road along the Trishuli River. On the way we admire terraced farm lands and beautiful huts. After reaching a juncture at Mugling, we move straight ahead towards Pokhara. At Dumre, we leave the previous road and head north to Besisahar, there will be connecting drive to Jagat by local jeep, total drive today will be around 8 hours. Alternatively, we can just drive to Bulbule or Khudi from Kathmandu to avoid long ride but that will add one extra day in your itinerary. Overnight in stay at Jagat. Meals included: Breakfast, Lunch Dinner. Day 04 :Jagat to Dharapani 1860m (5/6 hours) You start your trek in the morning after breakfast, the trail goes gradually uphill to Chamje and you cross another suspension bridge and follow the steep rocky trail until reaching Tal village which takes 3 and half hours. You can see again very beautiful waterfalls in Tal. You have lunch break here. Then you continue again on a rocky trail to Kotro, which takes about 2 hours. You continue straight and cross the suspension bridge near Lower Dharapani. You continue a little more climbing and arrive in Higher Dharapani. Overnight in Lodge. Day 05 :Dharapani to Koto 2600m (5/6 hours) You begin your trek in the morning towards Bagarchhap which takes about 1 hour passing through pine and fir forests. You can visit the white washed monastery in this village. Then you continue your trek till Danaque it takes about 1 hour. The trail is ascending steeply until Timang which takes about 1 and half hour. You have a good view of Mt. Manaslu and Peak 29. Now your trail continues through pine forests again till Latamarang which takes about 1 and half hour. You have lunch break here. After lunch, you walk again through forests and you have a short glimpse of Annapurna II. Finally you arrive in Koto village after 1 and half hours walk. Overnight in Lodge. Day 06 :Koto to Meta 3570m (6/7 hours) In the morning, you register your restricted area permit at the Police check post. Then you start your trek through the River bank of Suti Khola again through wonderful pine forests passing many streams and suspension bridges until reaching Dharmasala which takes about 5 hours. You can see a picturesque Waterfall near the Dharmasala. You have your packed lunch on the way. Then you continue your trek again through forests and ascend steeply till Meta Village, which takes about 1 and half hour. Now you have arrived on the Tibetan Plateau. You have very good view of Annapurna II and Lamjung Himal. Overnight in Lodge. Day 07 :Meta to Kyang 3840m) (4 hours) Today, you start with up and down as well as on traversing suspension bridges over diffrent streams. Again packed lunch at Kyang which takes about 4 hours. Actually you do not find any houses and lodges in this area. You just see the remnants, particularly the ruined forts of the Khampa settlement (the place which Khampa refugees from Tibet once captured and lived illegally) at places like Jhunam, Chyakhu and Kyang. We pitch our tents and prepare dinner as well. Overnight in Tent. Day 08 :Kyang to Phu 4080m (3/4 hours) In the morning, we prepare our breakfast then you keep walking passing the Phu Khola on a rocky trail until Phu village which takes about 3 hours. You can see Blue Sheeps during the trail. Now you are in one of the unique Lost/ Hidden Valleys. You can see their cultures, natural diversity, religion of the ethnic groups like Lama, Gurung and Ghale. The people are depending on subsistence agricultural, animal breeding and seasonal migrations. The very old Buddhist Monastery known as Tashi Lakhang Monastery is listed out of the 108 world’s great Buddhist Monasteries; it is believed to be the last monastery constructed by Karmapa Rinpoche. You have a great view of Himlung Himal and other snow peaks. Overnight in Lodge. Day 09 :Phu to Nar Phedi 3,490m (5/6 hours) Retrace the route back down towards Meta, but turn off at the Nar Phedi monastery, which will be your accommodation for the night. In fact, the monastery is all that Nar Phedi consists of! Day 10 :Trek to Nar Village 4,110m (2/3 hours) Today is a very gentle day. Climb out of Nar Phedi and follow a winding path up a hill towards Nar. Pass a line of wonderfully painted, bamboo-topped chortens on the way into the ancient village. Arrive in the town around lunch time. Even though Nar is not far from the main Annapurna trail, it is rarely visited by trekkers and is about as picturesque as it gets. Day 11 :Trek to Ngawal (3,675m) via the Kang La Pass (5,240m) Today is a long day, so get up before sunrise and head towards the Kang La pass, which leads back onto the popular Annapurna Circuit. It is not a difficult pass, but it can be a long day as the effects of altitude will be felt. Once on top of the pass you can enjoy an amazing view over Annapurna II, Gangapurna, and Tilicho Peak. The trail down starts off steep, but if you enjoy scree running you can have some fun! Stop for lunch on a plateau overlooking the peak, then continue towards Ngawal. Day 12 :Ngawal to Manang (3,540m.) 3-4 hours walk. On this day, we trek to Manang. Trek continues enjoying panoramic views of the gigantic mountains and peaks walking through slopes. The time you get in the afternoon as we reach the village is enough to explore the village. The views of mountains from the village are astonishing. Experience the hospitality of the Manang people. Day 13 :Manang to Tilicho BC 4150m (5/6 hours) Today you ascend gently till Khangsar village which takes about 2 hours. You have an excellent view of the Annapurna Range, Tilicho Peak, Gangapurna Lake and other snow peaks. Then you continue your trek till Thare Gompa. It takes about 1 hour. You have lunch break here. After lunch you continue your trek slowly passing the big landslide area until reaching Tilicho Base Camp which takes about 3 hours. Overnight in Lodge. Day 14 :Tilicho BC to Tilicho Lake 4920m (3/4 hours) Tilicho BC to Tilicho Lake 4920m (3/4 hours) Today, the trail steeply ascends and brings you to Tilicho Lake which takes about 3 hours. You take a packed lunch from your Lodge. Then again, we pitch our Tent for one night. You have a great view of Lake and Mountains as well. Overnight in Tent. Day 16 :Dharamshala to Jomsom 2710m (4/5 hours) Your trail slightly descend passing a Goat farm until reaching Thini Gaon which takes about 4 hours. The Jomsom village is 30 minutes ahead of you. You stay for lunch and the night here. You are free to relax or explore the village in the afternoon. Overnight in Lodge. Day 17 :Jomsom to Pokhara by flight and rest and relax Pokhara. Early in the morning, you fly back to Pokhara and transfer to the Hotel. You can do sightseeing with your guide in Pokhara. Overnight in Hotel. Day 18 :Pokhara to Kathmandu by tourist bus (6/7 hours) Early in the morning, drive from the Pokhara to Kathmandu by AC tourist bus it takes around 7 hours to arrive in Kathmandu and transfer to your hotel. Day 19 :Free day in Kathmandu. The Nar phu Valley with Tilicho Lake trek comes at the end. it is your trip conclusion day, nothing but we organize a farewell dinner with our client and we share e-mails and contact numbers with your fellow trekkies and and friends. International and domestic airport transfers by private car/van depending on group size. 3 Nights double/twin deluxe room in 3 star category boutique hotel in Kathmandu with breakfast. 1 Night double/twin deluxe room in best tourist standard hotel in Pokhara with buffet breakfast. 1 Well experienced, government registered, English speaking friendly and helping guide. Jomsom – Pokhara by domestic flight worth USD 114 per person. Pokhara – Kathmandu by tourist A/C tourist coach for all team. Tented accommodation on twin occupancy basis during the camping period. Boiled hot water during the trek. ACAP (Annapurna Conservation Area project) Permits. This trek is possible in the monsoon (June-August) as well as the two peak tourist seasons (March-May and September-November). The trek is still enjoyable in the monsoon, although the road access in the mountains to and from Besisahar could be disrupted by mud and landslides. In the winter (December-February) the high pass could be impassable with snow. This itinerary can be modified by taking Mesokanto La Pass off and rejoining the Annapurna Circuit at Yak Kharka upon visiting Tilicho Lake if so we will be trekking through Yak Kharka, Thorung Phedi, Muktinath and Jomsom (before flying back to Pokhara). Total time for this trip, including the Nar Phu section, is 19 days. If we combine Nar Phu and Tilicho Lake with Annapurna Circuit; then the trip cost will be cheaper as we do not need to camp that will cut off employing extra porter to carry camping gear and foods. The attractions of this variation are the chance to visit the pristine blue waters of the highest lake in Nepal, the pilgrimage temple at Muktinath (holy to both Hindus and Buddhists), and the frontier town of Jomsom, on the edge of Lower Mustang. This is a challenging trek due to the long days and steep ascents in altitude. Because of limited accommodation options on the way, there is little flexibility in the distances that must be covered each day, hence the long days of walking. The gains in altitude each day are quite steep, and it is always unpredictable how one’s body will react to altitude. This trek would best suit those who have a lot of experience trekking in the mountains, and who are fit and healthy. A real mixture of accommodation is available on this trek. In Besisahar there is the chance to stay in simple but comfortable hotels. On the trek, lodge accommodation is generally basic, as this is not a well-developed trekking route. In Nar Phedi, accommodation is in the local monastery. Food varies from simple but adequate meals in the smaller villages to staple trekker fare in the larger places, including luxuries like apple pie! If you choose our standard itinerary there will be tented accommodation for 3-4 nights and we will be providing adequate light trekking meals. Safety comes first while trekking with Wilderness Excursion! From your beginning day (we will be there to pick you up with our staffs and identity) to departure date (airport drop services) we are always there to help you. We have proper remedial services during the trek with professional staffs; first aid kit, oxygen bag and Helicopter service for emergency rescue whenever trekkers get physical Loss or altitude sickness. We have focused more on acclimatization days to get rid of altitude sickness too. From September to November, the permit costs $90 USD per week per person. From December to August, it’s $75 USD. In addition ACAP permit is required thats cost NPR 2360 per person. We realize that financial protection is a consideration when choosing a company who to book a holiday property through. Wilderness Excursion holds a License with the Authority to operate adventure activities under the supervision by Nepal Government. We are a fully bonded Adventure operator authorized by the Nepal Government. Tourism and Civil Aviation Department. Nepal Tourism Board, Industry Department. Nepal National Bank and the Taxation Office. We are also affiliated with several prestigious regulating bodies such as NATTA, NMA, TAAN, and KEEP with whom we have a bond. We know that the last thing you want to worry about when you’re planning your trip of a lifetime is whether your money is in safe hands. As a leading Adventure provider it’s our job to make sure your finances are secure, so when you book with us you can be confident that we do just that. To ensure that you have complete peace of mind Wilderness Excursion is an authorized adventure travel agency. Please kindly check our legal documents if any doubt.